Stopping or cutting down your cannabis use is achieved in two stages – i.e. Part 1 and Part 2, as shown below. Please note that for the course part of the website, you may need Flash Player 6 otherwise it will take time to download the website. If you don’t have Flash Player 6, you can download it from there website. In the first stage you sign up, and you make a record of how much cannabis you have smoked in the past week. You make lists of the pros and cons of using cannabis, and you set targets for yourself. Then you set some goals for yourself. In the second stage, you start to gain control over your cannabis use. You will be asked to keep track of when you feel a craving for cannabis and when you actually smoke some. The website automatically produces some graphs and tables showing you this information. These can give you a clearer understanding of the kinds of situations when you have trouble saying ‘no’ to your urge for cannabis. These are your ‘risk situations’. The website then helps you to prepare yourself to deal with these difficult situations. It provides a number of tools to help you do this. The demonstration below shows a sample page for each step of the course. The first step is to enter your name or a self-chosen nickname. 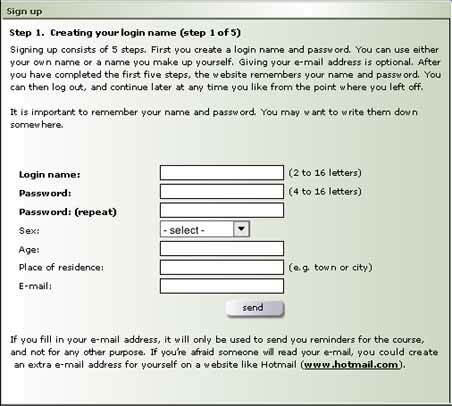 After step 5 you can use this name to log into and out of the website whenever you want.